Does Washington care about freedom in Iran? On the surface, it seems like a silly question. Ever since Ayatollah Ruhollah Khomeini swept to power in 1979, Washington policymakers of all political stripes have been holding out hope that a kinder, gentler regime would emerge in Tehran. Republican and Democratic administrations alike have expressed their support for freedom within the Islamic Republic, and both sides of the political aisle have condemned the regime's repressive domestic practices. Yet, concrete proof of the U.S. commitment to pluralism in Iran is hard to come by. The strategies by which the United States can assist Iran's opposition remain poorly understood and even less effectively implemented. This is unfortunate, since with the proper vision and political will, the United States can harness economic, diplomatic, and informational strategies to significantly affect the unfolding struggle for Iran's soul. The Carter administration, on whose watch the Islamic Republic took root, vacillated between appeasement of the new Iranian regime and complete political disengagement from it. Jimmy Carter's successor, Ronald Reagan, made isolation of Iran the official U.S. policy but did not seek to promote change there as he did within the Soviet Union's "evil empire." To the contrary, efforts to secure the release of American hostages in Lebanon even led Washington to embark upon an ill-fated plan to sell arms secretly to Iran's ayatollahs. The collapse of the Soviet Union had the effect of sidelining Iran as a foreign policy priority during the tenure of President George H. W. Bush. The Clinton administration took up the issue but quickly became paralyzed by internal divisions: Should it try to foster behavioral change within the ruling class or seek a more fundamental transformation of the regime itself? The George W. Bush administration seemed to bring a breath of fresh air. Its post-September 11 advocacy of a "forward strategy that favors freedom" fanned hopes among many that—in contrast to its predecessors—it would truly engage with pro-democracy forces within Iran. President Bush's calls for the Iranian leadership "to respect the will of its people and be accountable to them" also raised hopes. In practice, however, the principles of the Bush doctrine did not extend as far as the Islamic Republic. For all its talk about Iranian democracy, the Bush White House offered only nominal aid to those seeking freedom and pluralism within the country. Between 2004 and 2008, it authorized a total of $215 million in funding for all diplomatic programs dealing with Iran. But only a small fraction of that sum—some $38.6 million—was dedicated specifically to democracy promotion. And even those paltry funds were, in the end, diluted by bureaucratic infighting that served to undermine their effectiveness. Since taking office, the Obama administration has done even less. Eager to break with the policy of its predecessors and to engage with Iran's leaders, the new White House systematically downgraded the idea of promoting pluralism within the Islamic Republic. It eliminated the State Department's Iran Democracy Fund, the central node for pro-democracy funding during the Bush years, folding it into a generic Near East Regional Democracy (NERD) Fund that lacks a clear direction or mandate. It cut off funding for the Iran Human Rights Documentation Center, a nongovernmental organization committed to chronicling the regime's human rights abuses. It likewise rolled back funding for a raft of other groups from nongovernmental organizations such as Freedom House to the U.S.-funded International Republican Institute, putting their Iran-related activities at risk. In the process, it has sent the unmistakable signal that the United States is no longer interested in seeking substantive change in the nature of the Iranian regime or its domestic behavior. The focus on this state of affairs has sharpened since the summer of 2009. The results of Iran's June 12 presidential election—in which incumbent Mahmoud Ahmadinejad defeated all challengers in a contest blatantly punctuated by fraud and manipulation—generated widespread outrage in Iran, resulting in the most sustained outpouring of opposition since the 1979 Islamic Revolution itself. However, while Ahmadinejad's reelection may have catalyzed the current protests, it was not the reason for them. The underlying causes for Iran's turmoil run much deeper and can be traced back to the socioeconomic failures endemic to the current regime. These range from runaway inflation—officially cited at 13.6 percent but estimated to be at least twice that figure—to widespread poverty (with nearly a quarter of the Iranian population now estimated to live below the poverty line) to what is perhaps the highest rate of drug addiction in the world. Together, these factors have conspired to create widespread disaffection with the current regime—disaffection given voice by the "Green Movement" that coalesced in the weeks and months following the June 12 vote. The Islamic Republic has responded harshly. It has tightened its already strict control of the Internet, passing draconian new legislation to regulate assorted "illegal" activities on the web and turning social networking tools employed by protesters against their users. It has targeted opposition leaders, both secular and religious, seeking to discredit and silence them. It has sought to intimidate Iranian opposition activists living abroad. Additionally, it has attempted to shore up the legitimacy of Iranian supreme leader 'Ali Khamenei through a variety of measures, from a bid to alter the country's constitution to the elimination of potential clerical competitors. This response is understandable. Iran, after all, is a country in the throes of monumental internal transformation. Its population of 70 million is overwhelmingly young; nearly half (48.8 percent) is aged twenty-four or younger, according to official regime statistics. Iran's ruling elite, by contrast, is aging and infirm with the majority of the Islamic Republic's original revolutionaries in their late sixties and early seventies. This generational divide is deeply significant. It suggests that more than half of all Iranians have little or no memory of the Islamic Revolution itself and, as the events of the past half year make clear, are alienated from the Islamic Republic—and may now be looking for some sort of fundamental break with it. As the post-electoral crisis unfolded, the conventional wisdom in the Obama administration was that the United States could do little to assist Iran's opposition and that U.S. involvement would do more harm than good. In keeping with this belief, the president took pains to insist that the United States would not interfere in Iran's internal affairs, and his administration systematically muted its criticism of the Iranian regime's repressive domestic conduct. Over time, however, Washington has progressively reevaluated the viability of Iran's Green Movement and its chances for success. The State Department's point man on Iran, John Limbert, has gone so far as to draw comparisons between the current situation and the turmoil that preceded the 1979 Islamic Revolution. The Obama administration's lackluster response to Iran's internal ferment has thus far been predicated in part on the belief that engagement with the Iranian regime requires the United States to refrain from expressing support for regime opponents. Such a stance has served to buttress the Iranian regime, indicating to officials in Tehran that the international community will not weigh in decisively to prevent repression or to aid its opponents. This stance has opened up the administration to criticism that it has abandoned American values. A middle way exists, however. It lies in a model of "conditional recognition," under which the United States makes clear to the Iranian government that how it treats its internal opposition will directly influence how it is treated by other nations in a variety of spheres, including but not limited to commercial ties and diplomatic recognition. Such an approach is certainly not new. In the mid-1970s, the U.S. government applied a similar strategy toward the Soviet Union in an attempt to influence the Kremlin's internal conduct. That initiative—named "Jackson-Vanik" after its two main cosponsors, Sen. Henry "Scoop" Jackson (Democrat of Washington) and Rep. Charles Vanik (Democrat of Ohio)—linked most-favored-nation trading status for the Soviet Union to a liberalization of the USSR's draconian emigration policies. The approach worked: Eager to engage in commerce with the West, Moscow loosened restrictions on travel, granting freedom to a generation of Soviet dissidents and laying the groundwork for glasnost, perestroika, and the fall of the Soviet Union. The lesson remains valid today. For too long, legitimate concerns over the Iranian regime's atomic efforts have overshadowed serious discussions about human rights conditions within Iran. But Iran is a country deeply interested in international recognition and desperate for regional prestige and, therefore, vulnerable to pressure that questions its status on these two counts. Washington can exploit this opening in two ways. The first has to do with engagement. Outreach to Iran has been the centerpiece of the Obama administration's Middle East strategy, but as administration officials are quick to explain, it is not intended to be open-ended or to shield Tehran from the consequences of its actions on the nuclear front. The same should hold true with the regime's behavior at home. U.S. policy on Iran cannot become a foil that facilitates ever greater repression by the Iranian government. To make sure it does not, Washington will need to put Tehran on notice that the prospects for real, long-term dialogue—should the regime truly desire it—are as much a function of Iran's domestic practices as of its nuclear ambitions. The second focuses on trade. The United States today has little direct economic leverage over Iran, but here Europe can help. Collectively, the countries of the European Union serve as Iran's largest trading partner with an annual total trade of more than €25 billion ($34.25 billion). While European capitals have proved resistant to using this economic clout to pressure Tehran over its nuclear ambitions, there is reason to believe that the question of human rights might find a more receptive ear on the continent. That is because the countries of Europe, almost without exception, are signatories to the 1975 Helsinki Final Act, which obliges them to encourage "the effective exercise of civil, political, social, cultural and other rights and freedoms" abroad. Over the years, those standards have never been applied in any significant fashion to Iran as a result of human rights concerns. Washington, however, has the ability to make that laissez-faire attitude an issue and to nudge Europe toward taking a more active stance on altering Tehran's domestic behavior by highlighting the regime's widespread domestic abuses, and the moral imperative of disengagement as a result. By objective measure, official U.S. broadcasting toward Iran enjoys widespread popularity within the Islamic Republic. The U.S. Broadcasting Board of Governors estimates that the U.S. government's outreach to Iranians—encompassing the Voice of America's Persian News Network television channel, its radio counterpart Radio Farda, and associated websites—"has a combined weekly radio, television, and Internet audience of 29.4 percent of the adults in Iran." Audience, however, does not equal influence. Riddled with mismanagement, a lack of accountability, and a chronic absence of strategic vision, official U.S. broadcast outlets remain a marginal voice in Iranian politics. Four years ago, a study commissioned by the Iran Steering Group, jointly chaired by the State Department and the National Security Council, exposed these deficiencies. That report found that the main instruments of official U.S. broadcasting into Iran "fall short of realizing their stated mission and mandate" on a number of levels from self-censorship in the selection of content, to inadequate analysis and interpretation of important events, to a failure to properly frame sensitive political issues. Those conclusions still stand, despite the fact that in the years since that study was written, U.S. broadcasting into Iran has received major infusions of economic capital and political attention. However, structural reforms—such as greater linguistic proficiency among senior managers and more stringent oversight over programming—have lagged far behind, as highlighted in a scathing report issued by the State Department's inspector general in April 2009. Reversing course requires the United States to make major investments in a number of areas. Chief among them is clarity of purpose. The current disarray in official U.S. broadcasting is attributable at least partly to a lack of unambiguous direction from the country's political leadership. In its day, the Bush administration—for all of its lofty rhetoric to the contrary—sent mixed signals about its commitment to a fundamental, political transformation in Tehran. The Obama administration, preoccupied with engagement of the current Iranian regime, has so far refrained from articulating in an unmistakable and sustained fashion a commitment to political trends that might jeopardize this policy. If, however, the administration hopes to be able to influence Iranian politics over the long term, it will need to articulate much clearer support for political pluralism in the Islamic Republic. And once it does, it will need to enforce that policy throughout the bureaucracy that manages U.S. public diplomacy. This change, moreover, must be reflected in the quality of the actual content that is generated by U.S. broadcasting. Today, with some notable exceptions, U.S. outreach to Iran has degenerated into prolonged sessions of entertainment, often carried out at the expense of proven approaches to shaping the strategic landscape through cultural, intellectual, and historical programs. And the audience appears to have taken notice: Anecdotal evidence suggests that although U.S. broadcasts are ubiquitous throughout the Islamic Republic, they desperately need a reconfiguration that provides for greater discourse about liberal Western democracy, human rights, personal freedoms, and political independence. Key themes that require amplification include: U.S. support for opposition forces within Iran; the extent of regime brutality against its own people; the corruption endemic to the country's ruling clerical class; and the dangers that the Iranian regime's persistent quest for nuclear weapons poses to its own population. With Internet penetration estimated at over 25 percent of Iran's population of seventy million, the Islamic Republic already ranks among the most "wired" nations in the Middle East. This online community is both dynamic and vibrant; Iran is estimated to have some 60,000 or more active weblogs, making it the third largest blogosphere in the world (after the United States and China). It is not by accident that telecommunications capabilities and the Internet have been routinely interrupted since the June 12 election. Simply put, Iran's leaders are deeply and justifiably afraid of the transformative power of the Internet. If harnessed effectively, Iran's blogosphere can serve as a potent tool to highlight the shortcomings of the Islamic Republic. It can also provide Western policymakers with far greater understanding of the internal dynamics at play within the Iranian political system. An important first step in this regard is to facilitate the interaction between Iranian bloggers and Western media. Over the past year, a number of Western newspapers have provided forums for Iranian activists and dissidents to report and provide context on the events taking place within Iran. Such contributions, however, have been sporadic and ad hoc, even after the outbreak of unrest in June. Nor have news blogs such as Tehran Bureau, which was influential in reporting the early stages of post-election protests, managed to sustain the West's attention over time. Consistent input from these blogosphere sources is essential to informed policymaking. Simply put, without a good understanding of the evolving human terrain within Iran, Western capitals will find it impossible to formulate an accurate picture of the Iranian political scene and determine the most effective avenues to influence events there. To this end, Western media outlets should be encouraged to create a consortium of trusted Iranian bloggers to report regularly on events within Iran and to analyze their long-term implications. Such bloggers would not only serve to enrich Western reporting on events in Iran, they would provide policymakers and the general public alike much needed nuance and context as they attempt to navigate the rapidly changing Iranian political scene. During the summer of 2003, a resurgence of anti-regime protests rocked the Islamic Republic. Over the course of several weeks, thousands of protesters took to the streets of Tehran and other Iranian cities in a sustained series of demonstrations—the largest since the student uprising of 1999, which was bloodily suppressed by the regime. Foreign broadcasting outlets such as the Los Angeles-based National Iranian Television aided Iranian opposition leaders by allowing them to use their airwaves to coordinate activities and seek support from Iranians inside and outside the country. Unable to put an end to such foreign broadcasting itself, Iran turned to Fidel Castro's Cuba. Within days, Havana began using a Russian-built electronic warfare facility to jam both U.S. government and private broadcasts into the Islamic Republic. The interference eliminated a crucial outlet for political information and organization for Iranian protesters, effectively neutralizing the nascent democratic protests at a critical time as they had begun to spread across the country. Little has changed since. Although some in Congress have attempted to deter Iran's suppression of foreign broadcasts, these steps remain ineffective. A notable effort was the Iran Human Rights Act introduced by Sen. Sam Brownback (Republican of Kansas) in 2006. This piece of legislation outlined that the president "may impose diplomatic and, if necessary, economic sanctions on foreign governments or entities that assist the government of Iran in jamming, blocking, or otherwise preventing the free transmission of United States Government radio and television broadcasts into Iran." The Iran Human Rights Act, however, did not pass review by the Senate Foreign Relations Committee and was ultimately shelved by its sponsors. Iran's opposition, meanwhile, still lacks reliable, independent means for communicating and coordinating. But the West can help on this score. During the Cold War, the United States actively provided Soviet dissidents and opposition movements in the Soviet bloc with the technological tools to organize more efficiently. The United States has the power to do much the same today. By discreetly supplying Iran's opposition with communications equipment such as satellite phones, Washington could provide them with a low-cost, resilient way to coordinate with each other and with supporters outside the country. Who are Iran's future leaders? Today, the Green Movement remains chaotic and unfocused. Its most recognizable figures—failed presidential candidates Mir-Hossein Mousavi and Mehdi Karroubi—are hardly authentic champions of the opposition. On the contrary, both are establishment politicians: Mousavi served as prime minister from 1981 to 1989, the period during which the Islamic Republic established the Lebanese terrorist powerhouse Hezbollah and restarted the shah's nuclear program, this time with a military bent. Karroubi, for his part, served as speaker of Iran's parliament, the majles, from 1989 to 1992, and again from 2000 to 2004. Despite some reformist views, neither seeks to dismantle the Islamic Republic. Rather, both appear to be trying to preserve it, albeit in a form more palatable to the West. 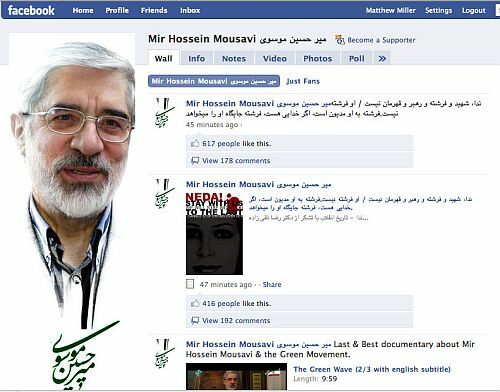 Failed presidential candidate Mir-Hossein Mousavi, here pictured on his Facebook page, is hardly an authentic champion of the opposition. On the contrary, he is an establishment politician. He served as prime minister from 1981 to 1989, the period during which the Islamic Republic established the Lebanese terrorist group Hezbollah and restarted the shah's nuclear program. Skeptics have highlighted the resulting leadership vacuum in arguing against the Iranian opposition's chances of success. These arguments, however, are ahistoric. It is useful to recall that, at its start, Poland's powerful Solidarity movement lacked clear and cohesive leadership. Figures such as Lech Walesa emerged over time, bringing with them the ideological cohesion and political power that helped Poland ultimately shrug off the communist yoke. At least some recent instances of grassroots revolution, such as the 2005 Tulip Revolution in Kyrgyzstan and the Cedar Uprising in Lebanon the same year, have followed similar evolutionary paths (albeit with very different results). Moreover, a cadre of activists capable of such leadership already exists within Iran. These nascent leaders come from all walks of life. They include union organizers such as Mansour Ossanlou, now incarcerated in Tehran's Evin Prison for agitating on behalf of greater rights for Iran's bus drivers, and clerics such as Ayatollah Yusuf Sanei, widely tipped to be the spiritual successor to recently deceased dissident Grand Ayatollah Ali Montazeri. These individuals may vary in their world-views and political agendas, but they share a common bond as enemies of the clerical state. Currently, the international community has little familiarity with these voices, but it would be better if it did. During the Cold War, Western politicians were intimately familiar with the identities of political prisoners, dissident activists, and others persecuted for opposing Soviet rule and agitated regularly on their behalf during diplomatic parlays with their Soviet counterparts. A similar focus today could provide much needed international attention to Tehran's most potent adversaries, restraining the regime from dealing with them quite as ruthlessly and infusing regime opponents with a renewed sense of political direction. Today, Iranian politics are dominated by a deep divide. On one side is Iran's repressive theocratic regime—a clerical junta that ranks as the world's most active state sponsor of terrorism and which is hell-bent on acquiring a nuclear capability. On the other are the people of Iran—a vibrant constituency that holds the future of the country in its hands. The course of their confrontation will determine the nature of the Iranian state and its place in the world for years to come. For the United States and its allies, this struggle carries enormous consequences. The emergence of a more accountable, pluralistic regime in Tehran would allay—if not eliminate—mounting concerns over Iran's emerging nuclear capability and regional adventurism. Such a regime could create the conditions necessary for the historic rapprochement between Washington and Tehran so sought after by the Obama administration. As it adapts its Iran policy, the White House should make every effort to support the forces of pluralism there in order to make such an outcome more likely. Ilan Berman is vice president of the American Foreign Policy Council in Washington, D.C. He is the author, most recently, of Winning the Long War: Retaking the Offensive against Radical Islam (Rowman and Littlefield, 2009). The National Security Strategy of the United States of America (Washington, D.C.: The White House, Sept. 2002). The New York Times, Dec. 21, 2002; CNN News, Dec. 21, 2002. "Iran All-Spigot Funding Chart," White House, Office of Management and Budget, July 18, 2008. The New York Sun, Nov. 8, 2007. Bari Weiss and David Feith, "Denying the Green Revolution," The Wall Street Journal, Oct. 23, 2009. The Boston Globe, Oct. 6, 2009. Weiss and Feith, "Denying the Green Revolution." Mehdi Khalaji, Patrick Clawson, Michael Singh, and Mohsen Sazegara, "Iran's 'Election': What Happened? What Does It Mean?" Washington Institute for Near East Policy, Washington, D.C., Policy Watch, no. 1537, June 18, 2009. Associated Press, Jan. 21, 2010. "Iran, Islamic Republic of: Background" United Nations Childrens' Fund (UNICEF), accessed Feb. 10, 2010. The Washington Post, Sept. 23, 2005. Press TV (Tehran), July 20, 2009; Evgeny Morozov, "Are Iranian Authorities More Sophisticated than We Think?" Foreign Policy, July 10, 2009. See, for example, "Iran: Stop 'Framing' Government Critics," Human Rights Watch, New York, July 21, 2009. The Wall Street Journal, Dec. 3, 2009. Reuters, Nov. 14, 2009; Associated Press, Nov. 26, 2009; The Christian Science Monitor, Jan. 6, 2010. "A Glance at Iran: Population," Statistical Centre of Iran, Vice-Presidency for Strategic Planning and Supervision, Islamic Republic of Iran, accessed Feb. 10, 2010. The Boston Globe, Nov. 4, 2009. The Wall Street Journal, Jan. 9, 2010. "Interview, Embassy-Hostage-Turned-U.S. Envoy Compares '79 to Iran Today," Radio Free Europe/Radio Liberty, Jan. 6, 2010. See, for example, Rep. Mark Kirk, remarks before the United States Institute of Peace, Washington, D.C., Nov. 4, 2009. "Trade, Countries, Iran," European Commission, Brussels, June 1, 2009. Final Act, Conference on Security and Co-operation in Europe, Helsinki, Aug. 1, 1975. Jeffrey Gedmin, "Our Iranian Colleagues Believe in Radio Farda's Mission," Middle East Quarterly, Fall 2008, pp. 53-6. "Broadcasting Board of Governors Fiscal Year 2010 Budget Request," Washington D.C., p. 25, accessed Feb. 12, 2010. "Draft: A Study of USG Broadcasting into Iran Prepared for the Iran Steering Committee," U.S. Department of Defense, Office of the Secretary of Defense, Sept. 14, 2006, p. 1. The Washington Times, Apr. 14, 2009. "Draft: A Study of USG Broadcasting into Iran," p. 1; J. Scott Carpenter, "Challenging Iran on Human Rights," The Journal of International Security Affairs, Spring 2010. Freedom on the Net: A Global Assessment of Internet and Digital Media (Richmond, Va.: Freedom House, Apr. 1, 2009), p. 70. See, for example, Shawn Woodley, "Iran: On Blogs and Ballots," Diplomatic Courier, June 14, 2009. See, for example, Heshmat Tabarzadi, "What I See on the Frontline in Iran," The Wall Street Journal, Dec. 17, 2009. The Washington Times, July 16, 2003. "Memorandum for the 303 Committee," Nixon Intelligence Files, Subject Files, USSR. Secret. Eyes Only, National Security Council, Washington, D.C., Dec. 9, 1969. See, for example, Flynt Leverett and Hillary Mann Leverett, "Another Iranian Revolution? Not Likely," The New York Times, Jan. 6, 2010. "Rights Crisis Escalates: Faces and Cases from Ahmadinejad's Crackdown," International Campaign for Human Rights in Iran, New York, Sept. 20, 2008. The Christian Science Monitor (Boston), Jan. 6, 2010. Related Topics: Iran | Ilan Berman | Spring 2010 MEQ receive the latest by email: subscribe to the free mef mailing list This text may be reposted or forwarded so long as it is presented as an integral whole with complete and accurate information provided about its author, date, place of publication, and original URL.